2 channel video and audio synced DVDs 11' 50"
Danielle Arnaud is pleased to present Camera and Calisthenics, an exhibition that brings together Lynne Marsh’s two latest video installations Stadium 2008 and Camera Opera 2008. In these works Marsh pursues and reconfigures the complex borrowings and cross-fertilizations between artistic modernity and mass culture. Using codified cinematographic techniques, the works draw on the languages of digital animation, sports coverage, television broadcasting and the performance and cinematography of the early twentieth century. In precise choreographies -that oscillate between exercise and dance -the camera, the space and performers compete for the leading role. The Olympiastadion in Berlin, the infamous site of Leni Riefenstahl's film on the 1936 Olympic Games, is both setting and protagonist in Stadium. Marsh employs techniques favoured by Riefenstahl, including the crane shot, long circular travelling shot and low-angle shot. The resulting footage exhibits the persistent legacy of representations of power and control in photography and cinema all the way up to contemporary imaging from video games to epic films. Faithful to this notion, the film opens with a 3D animation of the architect's model of the stadium’s recent renovation and transitions to the site itself with sweeping multiple camera perspectives that produce a feeling of vertigo and banal repetition. Here, a figure in white performs a careful choreography of gestures. In Stadium, Marsh creates an uncanny dialogue between the mechanistic, standardized and absolute uniformity of the architecture and the anonymity of the individual. Camera Opera is filmed on the set of Das Duell, a German current affairs television program. 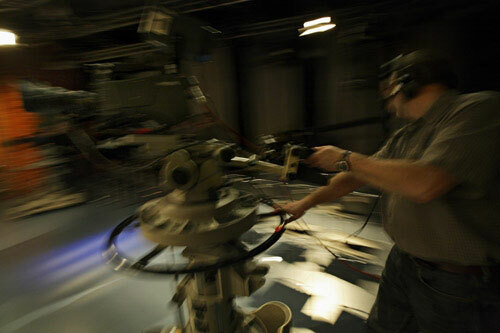 Marsh reverses the role of the cameras in conventional news broadcasting: they become the subject and the performance of filming becomes the action. Marsh directs five camera operators through a series of choreographed movements around the silent figure of the anchorworman. The operators circle around the studio, focus on the anchorwoman and pan out to expose the set, equipment, lighting, audience seating and each-other. The performance is set to Strauss waltzes that were piped into the studio to guide the camera operators' movements and later edited in sync with the image to form the final two-screen film. What we see is how the space of the studio is organized through and by camera views, and how the set may become a performative space based on a series of codified relations. 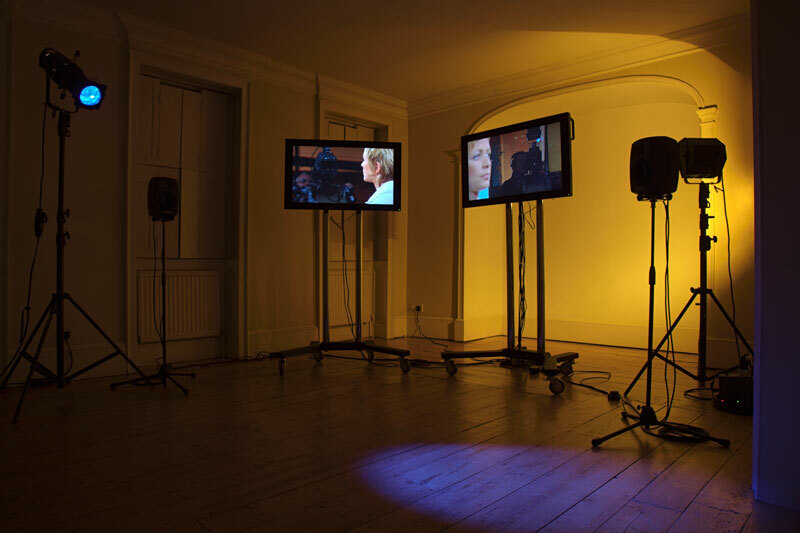 Engaging the Brechtian techniques of alienation, Marsh turns the cameras on themselves, denying their traditional role of relaying information and exposing their participation in the manipulation of what the viewer is presented with. Marsh’s works also rely on the spatial and immersive properties of multimedia installation, as well as on the historical connotations of installation as medium and form, to create parallel and speculative spaces of reflection and spatial inhabitation for the viewer. Lynne Marsh was born in Canada and has been living and working in London since completing her MA at Goldsmiths' in 1998. She has exhibited internationally, with recent solo shows including Künstlerhaus Bethanien, Berlin (2007), Steve Turner Contemporary, Los Angeles (2008), and the Musée d'art contemporain de Montreal (2008). Recent group exhibitions include Nightcomers, 10th Istanbul Biennial (2007) and There is no audience, Montehermoso, Vitoria-Gasteiz, Spain (2009). Her videos have been screened at the BFI Southbank (2007) and Artprojx at Prince Charles Cinema (2009). Marsh’s work will be presented in an upcoming solo at the Globe Gallery in Newcastle and as part of Catastrophe, Québec City Biennial in 2010. A monograph on her recent works produced by the Musée d'art contemporain de Montreal and the Musée régional de Rimouski will accompany the exhibition. Marsh is Senior Lecturer in Fine Art at the University of Herefordshire.